Over many years, Formula 1 serves as one of TAG Heuer’s pocket-friendly items. This fantastic product features quartz movements which keeps the price at a comfortable spectrum. Now, the company has launched its first men’s mechanical model that depends on automatic motion, the Formula 1 Calibre 16 chronograph. Sharing physical features of the impressive Formula 1 collection, the new Calibre 16 will receive a lot of attention from lovers of classic watches. Also, many Mechanical Purists will get intrigued by this new product which attempts to combine luxury and moderate prices. Thus in this review, we will be looking at the features that make the Calibre 16 Formula 1 a classical watch to shop for. The Calibre 16 has an interesting back story. For one, it represents the first men’s Formula 1 in almost three decades that does not use quartz motion, It also claims a top spot in the Tag Heuer Formula 1 series. If you have used the quartz model for many years, the Calibre 16 serves as an ideal upgrade. With this in mind, the F1 Calibre 16 can stand against flagship watches such as the Calibre 16 Carrera or Link Chronograph. This reason is that all watches mentioned make up part of TAG Heuer’s mechanical watch collection. Now let’s look at features of the TAG Heuer F1 calibre 16. 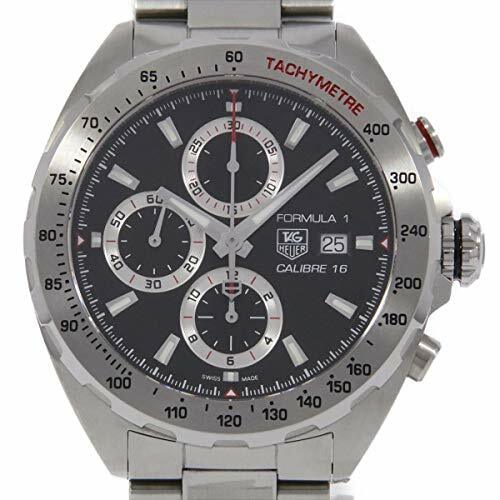 Formula 1 Calibre 16 chronograph. At first glance, it has a black or white dial hand with well-designed sport three hand timepiece. Both variants have a tiny second counter on figure 6. The counter either comes in black or white depending on the model with a small annular circle around it. The watch has a brushed 41mm wide case while it’s bezel and the crown looks mirror polished. All these specs combine to offer a watch that costs a fraction of the price of products with similar specs. The case shape and design of the TAG Heuer Calibre 16 F1 reminds us of the 1986 model. However, the current model has a 44mm stainless steel case which is a huge difference from its predecessors 34mm Fiberglass case. This large case will attract the interest of buyers who find think TAG Heuer’s recent male collection 42mm cases are small. Apart from the large width, the case also has a more considerable depth of 15.2mm which supports the more mechanical motion. Another exciting feature is the colored highlights on the watch’s push pieces and crown. For instance, the CAU offers orange highlights while the CAU2011 works with Red. You can find black highlights on the CAU2011 which completes it monochrome look. Unlike the Carrera, Link and Aquaracer models, the model name and TAG Heuer emblem are found on the dial. Also, the dials have a clean finish. On the stainless steel model lies a “starburst” Anthracite dial while the steel titanium carbide model has a classic black dial. Regarding the case back, its design looks similar to those found on quartz editions. 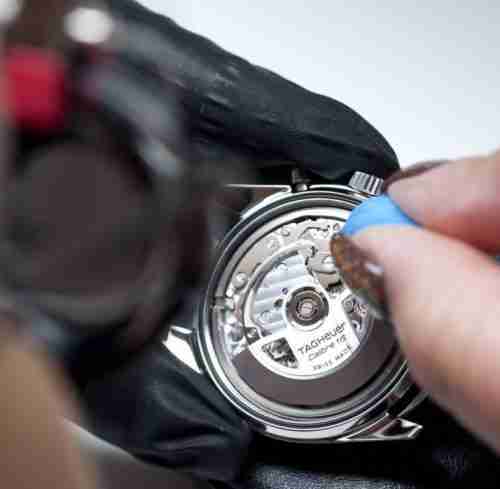 This means the TAG Heuer Formula 1 Calibre 16 does not have a sapphire case back but a steel one. Looking at the features of the latest F1, we feel TAG Heuer should have done more. Let’s tell you why. For one it comes with a steel and ceramic bracelet. This might push away people looking for either a steel or ceramic bracelet or not a combination of both materials. But the bracelet is an example of expert artistry. It features polished and brushed steel details. Also, the clasp of the Calibre 16 is the same used on all Formula 1 editions. It performs well; however, it does not meet the standard of flagship TAG Heuer watches. Its no surprise considering the budget price of the quartz Formula 1 which is a fraction of the cost of higher models. But the price of the Calibre 16 is ideal for a product with its features even if the rubber strap option does not suit the watch. Also, the fastener stands out because other parts of the Calibre 16 offer the quality of expensive TAG Heuer products. So the only part that shows the Calibre 16 as a budget device is the clasp fix. But the difference is not that obvious from the clasps on other variants. With this in mind, the watchmakers might consider better materials for the clasp. But that would mean a price increase which could affect the demand of the Calibre 16. Unlike most men’s watches, the sleek Formula 1 Calibre 16 is lightweight and fits your wrist perfectly. Also, the watch has a solid look without looking bulky even with its high-grade watch case. However, the rubber strap does not have a top-notch look common with other TAG Heuer models. Considering the case, Calibre 16 follows the tradition of regular Formula 1 products. For instance, its case measures about 43mm. 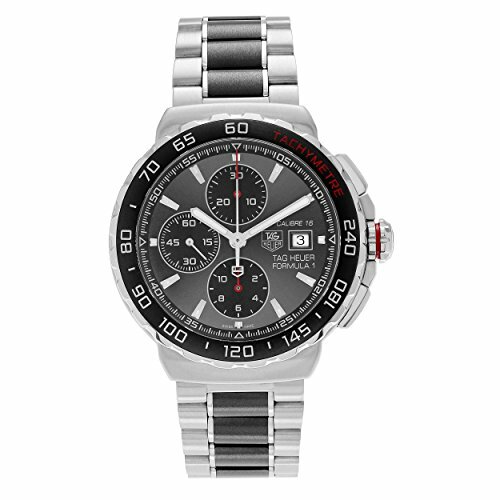 Previously TAG Heuer offered three hand watches of 41mm with the chronograph at the 43-44mm mark. However, with the call for larger watches, three hand watches have also had an increase in their size. Although we believe the watches designers have their reasons for such action, we would like to see smaller cases with great specs. Also, the stainless steel case is polished on one side while the upper case has a brushed finish. 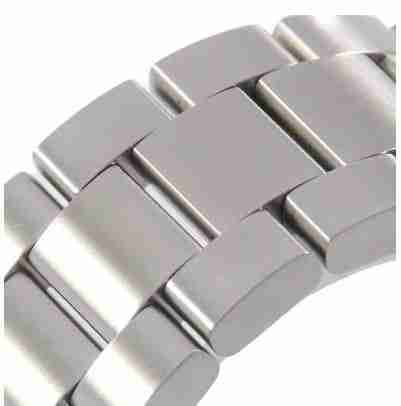 Other polished parts include the double crown and the bezel while the bracelet and end pieces remain brushed. The watch offers a contrasting flange and subdial ring dial that catches the interest of any watch snob. The reason is that it reminds us of the 2016 Formula 1 Red Bull Edition. Following the success of the “Panda” and “Reverse” Panda watches the latest Calibre 6 uses this spec with its three hands and subdial. Also, we love the limited use of red on the second’s hand and the tiny red triangle on the minute flange of the Calibre 16. With this said, it gives welcome relief from TAG Heuer’s previous practice of using too many colors or details on its dial. 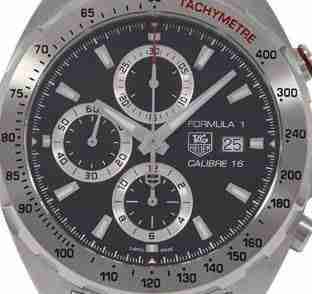 You might wonder why the Formula 1 chronograph has a Tag Heuer logo on their dials with “TAG Heuer” text. Surprisingly, this spec is not common with other watches from the brand. The practice began when an executive at TAG Heuer was not happy with selling a “Formula 1” chronograph even after its contract with the car racing brand had ended. This continued for about two decades before an agreement was reached to include the watchmaker’s name. This led to the “TAG Heuer Formula 1” title. Although it solved the conflict, the chances are that it did not entirely solve the issue on ground. Watches of the Calibre 6 collection have steel case backs like other Formula 1 models. The case includes a basic design complete with a chequered flag pattern which covers most of it. Considering TAG Heuer’s love for Sellita calibers, we expect an SW 260-1 to support the latest Formula 1. The Wristwatch comes with great quality for a lesser price. However, buyers from the farther part of the world might get theirs at a higher price. The price is ideal if we choose to compare the cost of the 2014 model. Also, no matter how high, the fact that it uses mechanical movement instead of quartz makes it a top choice. 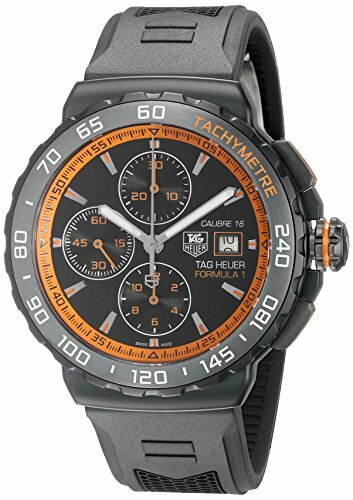 Furthermore, the F1 stands out with its sporty look when along with other mechanical TAG Heuer products or watches that cost under $3000 like the Aquaracers. We also believe these chronographs will record a considerable success with consumers. The watch has two models which come with either a steel or ceramic bracelet. Regarding the ceramic bracelet, it has brick inserts made from the same material while surrounded by polished steel. Overall, the watch has a trendy design. Although it shares physical features with the TAG Heuer Formula 1, it beats the later with its matured look. Also, they are pretty expensive than most Formula 1 Calibre 16 watch. The CAU 2012 represents the sporty side of this collection. For example, it has comes with a black dial, case, bezel and rubber strap. Orange highlights break the monochrome look. I am happy to see TAG Heuer expand the color palette for the F1 which was previously available in bright colors. Interestingly the CAU 2012 comes as the only watch that indeed reminds us of Formula 1. 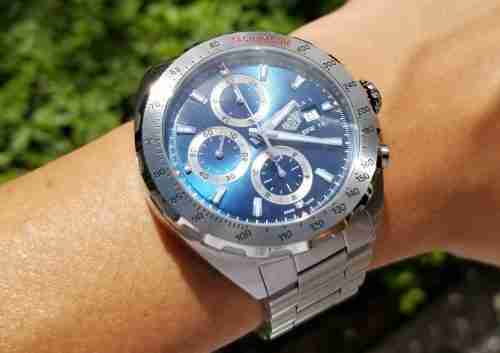 It also has a distinct look from other watches from TAG Heuer. Also, Tag Heuer might launch new color options if this model gains a huge following. Initially, we had the notion that the Formula 1 range should include products that feature quartz, top-notch movements, vibrant colors, and a pocket-friendly price. The reason is that such specs follow the tradition of both the collection and motorsports. However as we have seen the new watches, we have a different view. 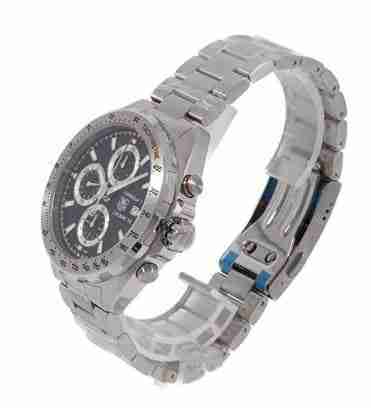 For one, this range comes as an upgraded collection comparable to top models such as the Carrera, Link, and Aquaracer. It also has a great price while displaying impeccable design (if we choose to ignore the deployment). Although quartz movements on Formula 1 watches might not end any time soon, we believe more watches will follow the path set by the 44mm Calibre 16 Formula 1 series.